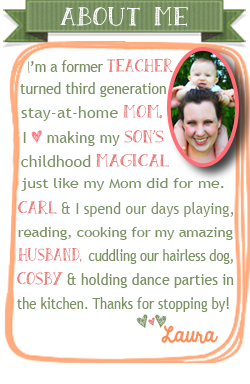 Kudos Laura for your desire to be home with your son! You have a beautiful blog and I was wondering how you had pulled such a great place together when I realized your blog was so new (I'm learning as I go and make updates all along, trying to get where I want to be). Then I saw your little note at the end of your post - you've done this before! It all looks great. Best wishes on your journey! Thanks so much Karen! I ran my other blog for about 6 months and learned a lot in that little bit of time. It was definitely much easier setting this blog up having done it before! Thanks for stopping by!